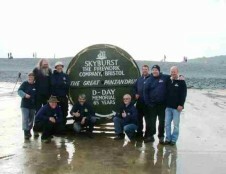 Skyburst Recreate Secret Weapon Designed for D-Day. The Great Panjandrum! 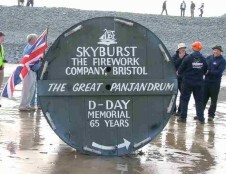 On 5th June 2009, Skyburst recreate their version of the ‘Great Panjandrum’. Unfortunately it never made the D-Day landings, but did make a roll on part featured in Dads Army! 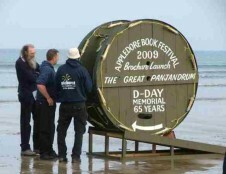 These great photos and videos reveal how the Great Panjandrum, one of the most bizarre British creations, was wheeled out on this day to celebrate the 65th Anniversary of the Normandy Landings. The original device was packed with over 400lbs of high explosives, reached a great height of 10ft and would be propelled to over 60mph, hoping to blast a hole in the Nazi’s Atlantic Wall Defence. But, during some of the first tests, it veered out of control nearly wiping out a whole audience of VIP’s! Sadly, further tests proved that the weapon was too unstable and unpredictable, due to miss fires and bumps on the beaches. All of the tests took place on Westward Ho! In North Devon, where it was very common to see a group of commanders and soldiers being chases up and down the by this rolling time bomb! So, the time had come for Skyburst The Firework Co to recreate this uncontrollable rolling disaster, which bought much joy among the team involved. Recreating the device slightly smaller, at 6ft high by 3ft wide, with much appreciated help from archive specialist Tony Koorlander, Skyburst were ready to get explosive! Nerves running high as the replica Panjandrum stood at the ready on a small ramp, everyone was praying that the untested replica was going to work! Counting down and standing clear, a wave of the Union Flag signalled the ignition of the device as it erupted into a shower of sparks! With all the rockets lit, and blasting away, the Great Panjandrum left the ramp blowing everyone away with its lack of speed. But, it was travelling in a steady straight line, which was a good result! Although the site was great to look at, there was great disappointment that the replica only travelled a mere 50 out of the proposed 500m. 10 workers from Skyburst spent two days attaching dozens of rocketsto the rims of the Drum, which had been commissioned by the organisers of the local Appledoor Book Festival. The original was designed by Nevil Shute Norway, who predicted it would travel at speeds exceeding 60mph and then to blow a hole in the wall large enough to drive a tank through! It’s a real shame it tended to attack our men more often than not! Please see the Videos below, first showing the replica Drum created by Skyburst, and the second with real footage of the original tests. The 4th July marks the Birthday of America. In 1776, on this day, the members of the second continental congress met in Philadelphia, adopting the final draft of the Declaration of Independence, proclaiming their sovereignty from Great Britain. There are many ways the American people choose to celebrate this day. 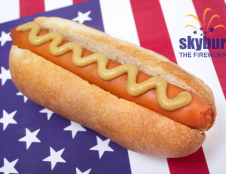 From BBQs and drinks, parades, festivals and even Hot Dog Eating Competitions! 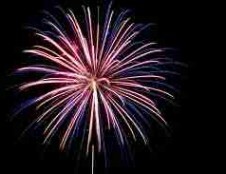 But the most popular it seems, is to celebrate with fireworks! Many people spot their opportunity to get out the house, and join thousands of fellow Americans to watch a Humongous Professional Firework Display. 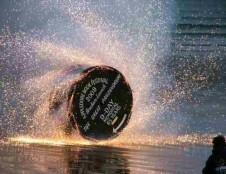 But it’s becoming more aware that people are choosing to do the celebrations at home, with friends and family in the garden, where they can perform their own celebratory private firework display. So, here are 20 facts you may or may not know about Independence Day. 3. The Declaration of Independence was penned by Thomas Jeffersonand signed by 56 men representing 13 colonies. 8. In July 1776, the estimated number of people living in the newly independent nation was 2.5 million. According to the U.S. and World Population Clock, the nation’s estimated population in July 2013 was 316.2 million. 18. The American Pyrotechnics Association (APA) estimates that more than 14,000 professional firework displayslight up the skies in the United States each 4th of July. So, the question is. What do you and your family do to celebrate the 4th July? Do you even celebrate it at all? Here at Skyburst, we think every moment in history should be celebrated like this, as we do Guy Fawkes Night. Don’t worry though, if you haven’t made any plans yet, its not too late! 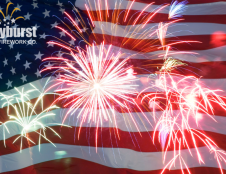 Order fireworks online now for your 4th July Celebrations, or give us a call to book your Professional Firework Display Now. 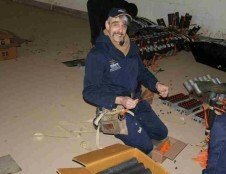 Fireworks and Funerals… Breaking the Tradition? Back in early 2000 Skyburst The Firework Company were approached for an interesting project, to scatter the ashes of a lost love one at the wake of the funeral. With Skyburst being a team of pyro-enthusiasts, they all thought this was as splendid idea, and were happy to help with such a special service. After testing many types/sizes of rockets, Skyburst finally found the perfect rocket which they felt would send them off in style as well as with a bang! As they deserved to be..
Skyburst didn’t want to handle the ashes without getting to know sed person they were sending off. After a little chat, over coffee, the team now knew who it was they were sending up and how great of a life they had. Skyburst team felt this was the right thing to do, to show respect to the lost loved one who was such a big part of the people around them. Once the process is complete, and required rockets filled. Skyburst will give you the option of taking the special rockets away with you, to send off in the perfect location. But, if you wanted to watch your loved one soar high into the sky, and burst with so muchbeauty, then Skyburst would come along to perform the send-off on your behalf. Once the word spread of the non-traditional unique celebration, Skyburst found this was becoming a very popular send off for many people across the country. With only 1 egg cups worth of ashes required per rocket, you can choose the amount of rockets you’d like with plenty left over for any other remembrance services. Its very rare Skyburst get asked to send off a whole person, but it does happen! With such a large request, this can fill up to anywhere between 30-40 rockets. With rockets being readily available to the public, to buy, transport and store easily, the rockets can be stored for the very special day. 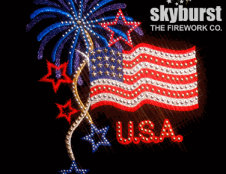 But Skyburst thought, why not incorporate someone so special into a fullprofessional firework display? This idea took of quickly, with requests for the largest burst possible! 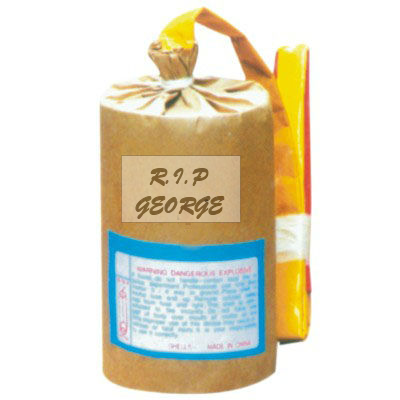 Skyburst have now celebrated loved lives in many high impact display, with the special person eruptingfrom large ground mines, to exploding high in the sky from a 5inch mortar shell. All the team at Skyburst are honoured to be a part of such a special occasion. Skyburst understand the importance of the someone’s final request, and how such a situation can effect the loved ones around them. Therefor they make the service as smooth and stress free as possible. To see how this service has affected others in the past, please read this touching story ‘We sent Mum’s ashes up in a firework’ which was recently featured in The Guardian.